An extraordinary and timely novel, a Walter Dean Myers Award Honor Book, examines what it’s like to grow up under surveillance in America. Naeem is a Bangledeshi teenager living in Queens who thinks he can charm his way through anything. But then mistakes catch up with him. So do the cops, who offer him an impossible choice: spy on his Muslim neighbors and report back to them on shady goings-on, or face a police record. Naeem wants to be a hero—a protector. He wants his parents to be proud of him. But as time goes on, the line between informing and entrapping blurs. Is he saving or betraying his community? 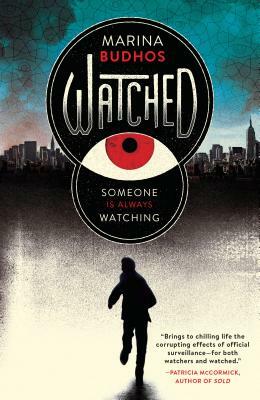 Inspired by actual surveillance practices in New York City and elsewhere, Marina Budhos’s extraordinary and timely novel examines what it’s like to grow up with Big Brother always watching. Naeem’s riveting story is as vivid and involving as today’s headlines. Marina Budhos is the author of award-winning fiction and nonfiction. Her novels for young adults are Watched, Tell Us We’re Home, and Ask Me No Questions. Her nonfiction books include Eyes of the World: Robert Capa & Gerda Taro & The Invention of Modern Photojournalism, Remix: Conversations with Immigrant Teenagers and Sugar Changed the World, which she co-wrote with her husband, Marc Aronson. Budhos has received an EMMA (Exceptional Merit Media Award), a Rona Jaffe Award for Women Writers, and two fellowships from the New Jersey Council on the Arts. She has been a Fulbright Scholar to India and is a professor of English at William Paterson University. “Watched reveals profound immigrant truths about survival and betrayal, and what it really means to feel like you belong. Everyone should read this necessary book.”— Moustafa Bayoumi, author of This Muslim American Life & How Does It Feel To Be A Problem?